Authorization code is one of the most commonly used OAuth 2.0 grant types. The authorization code flow is a "three-legged OAuth" configuration. In this configuration, the user authenticates himself with the resource server and gives the app consent to access their protected resources without divulging username/passwords to the client app. This topic offers a general description and overview of the OAuth 2.0 authorization grant type flow and discusses how to implement this flow on Apigee Edge. Watch a short video to learn how to use the OAuth 2.0 authorization grant type to secure your APIs. This grant type is intended for apps that are written by third-party developers who do not have a trusted business relationship with the API provider. For example, developers who register for public API programs should not generally be trusted. With this grant type, the user's credentials on the resource server are never shared with the app. You can find a complete, working sample implementation of the authorization code grant type on Apigee Edge in the api-platform-samples repo on GitHub. See the oauth-advanced sample in the api-platform-samples/sample-proxies directory. See the README file for details on the sample. 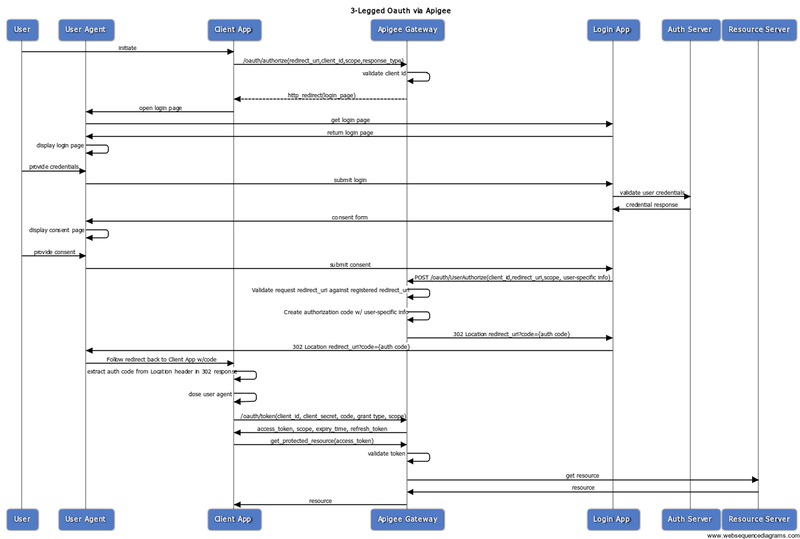 The following flow diagram illustrates the authorization code OAuth flow with Apigee Edge serving as the authorization server. Tip: To see a larger version of this diagram, right-click it and open it in a new tab, or save it and open it in an image viewer. Here is a summary of the steps required to implement the authorization code grant type where Apigee Edge serves as the authorization server. Remember, the key to this flow is that the client never gets to see the user's credentials on the resource server. Note: The illustrations below are taken from the authorization code sample implementation on GitHub. Prerequisite: The client app must be registered with Apigee Edge to obtain the client ID and client secret keys. See Registering client apps for details. When the app needs to access the user's protected resources from a resource server (for example, contacts list on a social media site), it sends an API call to Apigee Edge, which validates the client's ID and, if it's valid, redirects the user's browser to a login page where the user will enter their credentials. The API call includes information the client app obtained when it was registered: the client ID and redirect URI. The user now sees a login page where they are asked to enter their login credentials. If the login is successful, we go to the next step. In this step, the user gives the app consent to access their resources. The consent form typically includes scope selections, where the user can choose what the app is permitted to do on the resource server. For example, the user may give read-only permission, or permission for the app to update resources. 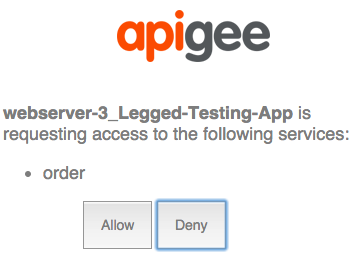 If the login and consent are successful, the login app POSTs data to the /authorizationcode endpoint of Apigee Edge. The data includes the redirect URI, client ID, scope, any user-specific information it wishes to include, and an indication that the login was successful. Note: It is important to note that the client app never sees this information. It is handled server-side and negotiated between the login app and Apigee Edge. For an example that shows how this step is handled securely, refer to the authorization code sample implementation on GitHub. Edge sends a 302 redirect with the auth code attached as a query parameter to the client. If everything is successful, Edge returns an access token to the client. The access token will have an expiration, and it will be valid only for the scope specified by the user when they gave consent to the app to access their resources. You typically configure this grant type flow so that each step or "leg" of the flow is defined by a flow in the Apigee Edge proxy. Each flow has an endpoint and a policy that performs the OAuth-specific task required, such as generating an authorization code or an access token. For example, as shown in the XML below, the /oauth/authorizationcode endpoint has an associated policy called GenerateAuthCode (which is an OAuthV2 policy with the GenerateAuthorizationCode operation specified). The easiest way to show the flow configuration is with an XML example. See the in-line comments for information about each flow. This is an example -- names of flows and paths can be configured however you wish. See also Configuring OAuth endpoints and policies for a quick overview of the steps needed to create a custom flow like this. See also the example implementation on GitHub. Call this URL from your Login app after you authenticate the user. Each endpoint has a policy associated with it. Let's see examples of the policies. See also Configuring OAuth endpoints and policies for a quick overview of the steps needed to add OAuthV2 policies to proxy endpoints. The API call to do the request is a GET and requires the query parameters client_id, response_type, redirect_uri, scope, and state. 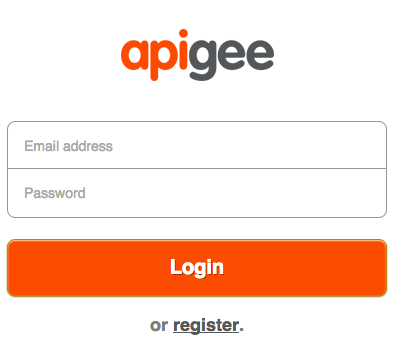 Best practice: The login app typically POSTs a redirect response back to Apigee Edge. Edge then directs the user's browser to the registered callback URL. It's a best practice not to send the response directly back to the user agent/client to avoid exposing sensitive information. This is the /oauth/authorizationcode path. It uses the OAuthV2 policy with the GenerateAuthorizationCode operation specified. This is just a basic summary. A production example includes many other policies for building up URLs, doing transformations, and performing other tasks. Refer to the sample on GitHub for a complete, working project. Attach a VerifyAccessToken policy (OAuthV2 policy with the VerifyAccessToken operation specified) to the beginning of any flow that accesses a protected API, so that it is executed whenever a request for a protected resources comes in. Edge checks to be sure each request has a valid access token. If not, an error is returned. For the basic steps, see Verifying access tokens. To call an API that is protected with OAuth 2.0 security, you need to present a valid access token. The correct pattern is to include the token in an Authorization header, as follows: Note that the access token is also referred to as a "bearer token". See also Sending an access token.